In an ischemic stroke a clot blocks a blood vessel to the brain, depriving oxygen and nutrients to part of the crucial organ. Without immediate treatment this can cause irreversible tissue damage, leading to complications ranging from behavioral changes to paralysis. Stroke is the fifth-highest cause of death in the U.S., and the leading cause of long-term disability. Ischemic strokes are the most common type, accounting for more than 80 percent of all cases. Until recently the only treatment available for ischemic stroke was tissue plasminogen activator, or tPA, a protein that can dissolve blood clots if injected up to four and a half hours after stroke onset. 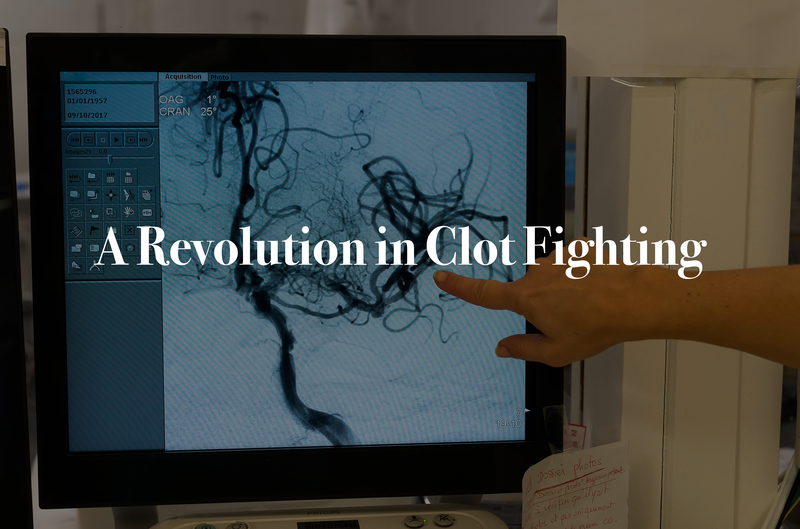 Care has improved dramatically in the last few years as advances in thrombectomy—surgical clot removal—have allowed doctors to clear larger blockages and treat patients up to 24 hours after symptoms began. But now, armed with guidelines for more rigorous animal studies and a better understanding of the processes that occur after stroke, researchers believe they are closer to finding compounds that can effectively reduce brain damage and lessen long-term effects on neurological function. Recent investigations in mice reveal that addressing the immune response—by inhibiting its harmful effects immediately after stroke or promoting its ability to aid recovery—may indeed lead to better outcomes. A collection of molecules called the “complement system” plays a key role in the body’s frontline defense against pathogens. When faced with microbial invaders, these molecules help immune cells fight off attackers and clear damaged cells and debris. But after a stroke this system can trigger harmful inflammatory processes that damage the brain. Scientists have tried to address this, with little luck. One of the key problems is their approaches typically involved administering a therapeutic compound throughout the body. This dampened the intended effect and could leave patients susceptible to infections, says Ali Alawieh, an MD/PhD candidate in immunologist Steve Tomlinson’s lab at the Medical University of South Carolina. Alawieh, Tomlinson and their colleagues developed a new method that would specifically target the injury site after an ischemic stroke. By combining Crry, a molecule that inhibits the complement system, and B4scFv, an antibody fragment engineered to identify stressed and injured cells, they were able to create a drug that could locate the stroke site and stop immune cells from attacking brain issue only there. The team induced strokes in mice and injected the combo (dubbed B4Crry) into their tails. Animals treated up to 24 hours after stroke had significantly less brain damage and fewer neurological problems, such as impaired movement and memory, than the untreated animals. The results appeared last month in Science Translational Medicine. Neurologist Alastair Buchan at the University of Oxford, who was not involved in the new study, says this is very intriguing approach. But he cautions that pinpointing exactly when and where to administer such a treatment in humans would be more difficult than it is in mice. Tissue in the human post-stroke brain may recover at different rates and therefore may not benefit from complement inhibition at the same time, Buchan explains. Tomlinson—who co-founded Admirx, a company developing complement inhibitors for stroke and other disorders—is currently trying to make his team’s antibody compatible with humans so the experimental compound can proceed to clinical trials. To address these long-term problems, some researchers are looking to target the inflammatory response days, weeks and even months after a stroke. The challenge, however, is that the role the immune response plays during these time periods is still unclear. Whereas brain inflammation is harmful when it occurs immediately after stroke, parts of the immune response that are activated later seem beneficial for recovery, says Arthur Liesz, a neurologist at Ludwig Maximilian University in Germany. “How different immune components behave in the chronic phase is still unknown,” he adds. Indeed, some research hints that promoting the activity of certain immune-response components during this later phase could aid in recovery after a stroke. New findings, reported last month in Science Advances by neuropharmacologist Mikko Airavaara at the University of Helsinki and his colleagues, suggest increasing the presence of debris-gobbling cells a few days after stroke may have beneficial effects. Airavaara and his team injected a neurotrophic factor (a type of molecule that helps neurons grow and survive) into the peri-infarct region—the brain tissue surrounding the site of a stroke—in rats. When this procedure was carried out a few days after an induced stroke, the animals exhibited some improvements in behavior. Further analysis pointed to a potential explanation: An increase in the expression of genes found in immune cells that consume debris indicated this cellular cleanup crew might be facilitating repair in the peri-infarct area. This work is still in the early stages, and Airavaara notes more research is needed to determine whether their compounds can help humans. Many researchers are currently investigating other compounds related to immune responses, both short- and long-term. For example, Fagan and her colleagues recently discovered that although administering a molecule called compound 21, which binds to certain hormone receptors in the brain, did not reduce brain damage after stroke—it did lead to less cognitive impairment weeks later. “This is probably not due to early neuroprotection but [an effect on] ongoing inflammation after stroke,” she says. Bix hopes administering neuroprotective agents alongside a thrombectomy—right at the site of the injury—may vastly increase beneficial effects. He and his colleagues are now conducting clinical trials to investigate whether repurposing drugs might work using this type of system. “I’m very excited about the potential of neuroprotective therapies to make a comeback,” he says.